Ski Faster with the MSR Team! Building great skiers is our passion! most comprehensive recreational racing resource. We're in the business of making you ski faster. Ski racing has come a long ways over the last 70 years. Technique is ever evolving, as is equipment, and racers look far different now then they did just a decade ago. Our mission at "Modern Ski Racing" is to provide a way for skiers and the recreational racer to not only come to understand exactly where that evolution has taken current technique, but to incorporate these modern techniques into their own skiing. Come join us. Allow us to show you the road to high level skiing and successful racing. 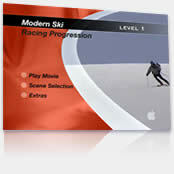 With our complete line of training products, like The Level 1 Modern Ski Racing Progression DVD, you'll be racing faster in a matter of hours. Click here to learn more.